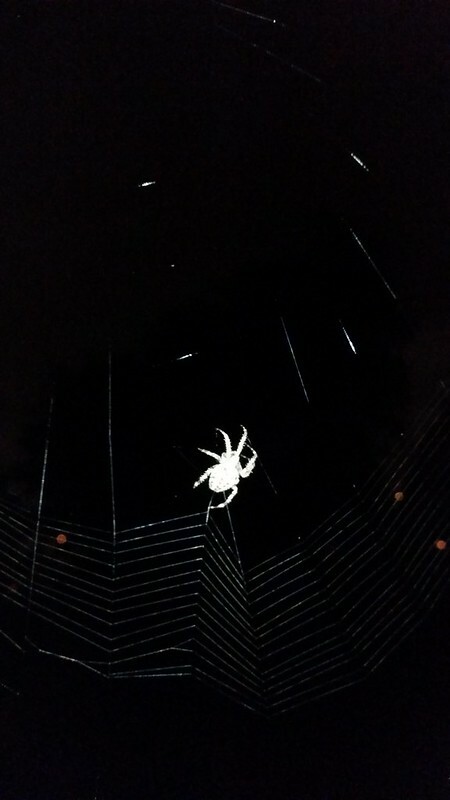 A spider weaving its web at night. So you don't often get to see a spider working away at his (or her) web. Thus when my wife pointed out this guy on our porch, though she was a little bit weirded out, we were both intrigued with the fellow working away. I believe this is the same type of spider as the one I posted last week or so, but it was hard to tell with only the light from my camera. I should have followed through in the morning to show the finished product but I forgot. I was happy that I managed to get the shot at all, given that it was night. But this shot I was happy with because it was clear the spider was in mid-work and pulling on a thread, creating that "V" section that you can see, largely connected to the spider's but, where it is spinning the web.